If you’ve spent any time here at all you know money is pretty tight for us. We never go hungry or anything, but there is very little cushion at times and for the past week or so, we’ve been scraping: no spending unless it’s gas in the car. That means no new groceries (we eat what’s already in the house plus the eggs from our chickens), no drive through coffees, etc.. It’s not a self-imposed period of no spending. There just isn’t any money until we get paid again, and so we tighten down and make do. This go around hasn’t been horrible (we’ve done it before), but the boxed in feeling is never fun. Thankfully, these periods pass, and on the other side, I feel a little more confident in our ability to live on very little, and far more grateful for the relative luxury in which we live most of the time. As far as cooking goes, when the money runs low, I’ve noticed I make a lot of two things: bread and beans. Suitable, right? So, today, I’m going to talk about bread and next time we’ll go over the method I use for beans. I know, I know. You’re on the edge of your seat! But these are great standbys to have in your arsenal if ever you need to tighten your belt. So, bread: I’ve written about the Artisan Bread in 5 Minutes a Day method before, and I still think it’s a super convenient way to make excellent homemade bread. It does, however, use a lot of yeast and, I’m wanting to cut back on that (mostly because I’m fascinated by the voodoo that is a naturally leavened bread and consider using less yeast as a step toward that and yes, I might be crazy). So, I have a new (to me) favorite that is similar in convenience but uses less yeast: Jim Lahey’s (the owner of NYC’s Sullivan Street Bakery) no-knead method. It’s been talked about here, there, and everywhere, and for good reason. This bread will make you swoon. It’s that good. It’s hard to believe that the luxurious, comforting, crusty loaf of bread that results is made only of flour, water, salt and yeast. Every time I make it, I feel like a magician. And like I’m stealing. Surely something so inexpensive can’t be this good or this simple, I think. But it is all of those things. And it’s perfectly suited to fill in the gaps of a lean week of meals. It’s as my Sicilian great-grandfather is quoted as saying, “you take one bite of meat, five bites of bread”. Good advice for our scrappy weeks. Note: this makes a pretty large loaf of bread and unless you are feeding a large group, you will have leftovers. This is a great opportunity to make toasts (bake at 375 degrees F for 10 minutes or so and rubbed with a clove of garlic) that you can top with anything you like (cheese, fried egg, wilted greens, all of the above, etc, etc). You can also make fresh breadcrumbs. Or, you can tear them in pieces, toss with olive oil and a bit of salt, bake until crunchy, and have the best croutons you have ever tasted. Combine all the dry ingredients in a medium-sized bowl. Add the water and mix with a wooden spoon or spatula until the flour is incorporated (not more than a minute). The dough will be pretty shaggy and sticky. Lightly oil another medium-sized bowl or large container with a lid and transfer the dough. Cover with plastic wrap or top and let sit for 12-18 hours at room temperature (about 70 degrees F). When the time is up (the dough will have bubbles on the surface), use a spatula to remove the dough from the container to a well floured surface. With floured hands, gently fold the dough over on itself once or twice (in half is fine). Let sit for 15-30 minutes more and then shape into a ball. Move dough to one half of a floured towel (not terry cloth, but a smooth kitchen towel). Sprinkle the top with flour and cover with the rest of the towel. Let rise for 1-2 hours, or until doubled in size. In the last part of the rise preheat the oven to 450-500 degrees F. Place the container and lid in the oven to preheat, as well. Once the dough has doubled in size, take the hot pot out of oven, take off the lid and place the dough in the pot seam side up. Don’t worry what it looks like at this point. You can transfer the dough to the pot while still on the towel by picking up the towel like a tray with two hands. Cover the pot and bake for 30 minutes. Uncover the pot and let bake for 15-30 more minutes. Remove from the oven and pot and let cool completely on a rack. gotta try this one too! i think i have a pot with a lid….. our kitchen is the size of a Barbie play house kitchen so i had to get rid of most of my kitchen stuff when we moved here. also, been thinking about adding a little something to the “5 min” bread next time. it’s delicious and i love the method but it could use a little umph. my old boss’s recipes always called for brown sugar or molasses or honey. the crust gets a little darker. little bit more flavorful. it’s also good for the yeast – but if you’re getting away from that anyways it doesn’t matter. i do like the simplicity of the basic ingredients though. just thinking out loud! i’ll stop now! 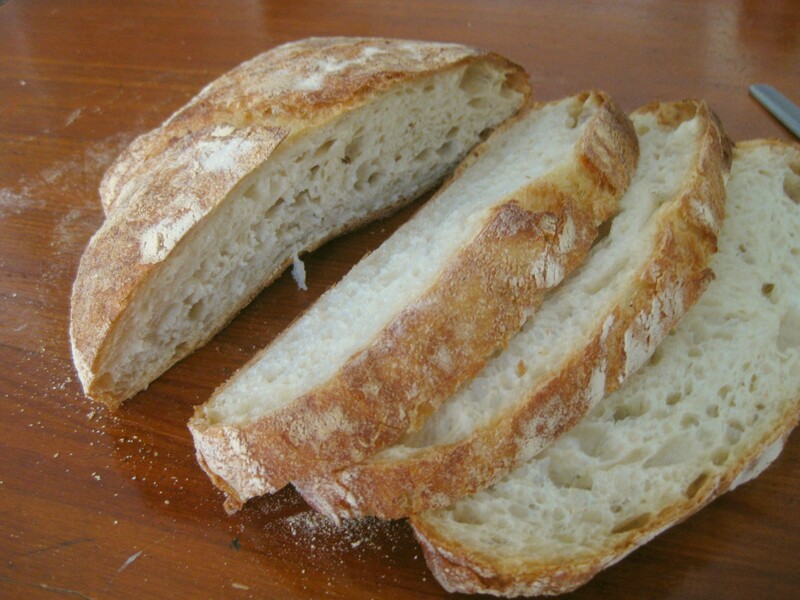 You are currently reading Jim Lahey’s No-Knead Bread at Space & Thyme.